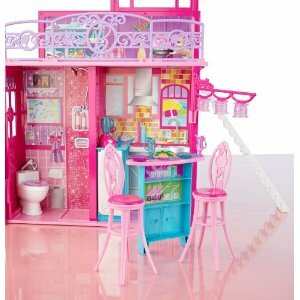 Your little Princess will love this Barbie Glam Vacation House . It is great value and features 2 stories and 6 areas of play including living room, bedroom, kitchen, bathroom, patio, and breakfast bar. Another great feature is that it folds up easily so it can be tidied away. You know when you buy those toys and then they take up so much room in the house? Well the Barbie Glam House folds away easily so it can be moved and stored around the house. There are lots of features on this Barbie house. You can rearrange the furniture, even move the Clip n Flip television around the house. The staircase is detachable, and the room on the second floor can be converted to a bedroom or an outdoor patio. When we look at a house we always need a great kitchen and Barbie is no different of course! The Barbie Glam Vacation House kitchen includes, a refrigerator, blender, glasses, plates, snacks and, a Clip n’ Flip breakfast bar (which you can also use in the outdoor rooftop patio). 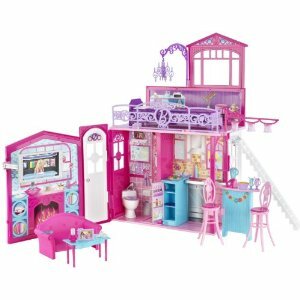 This Barbie house is likely to be a very popular buy which your child will get many hours of play and enjoyment from. It does have some small pieces so is suitable for ages 3 and up. High Quality Custom Travel Mug – Just $2 – You Save $12.99!